Beautiful Shire Silk Yarn This incredible 100% raw silk yarn is wonderful to touch, a tactile experience, and full of life and color. A wonderful palette - each color is enhanced by colored nubs spun into the yarn that create depth and interest. A perfect yarn for summer tanks, sleeveless dresses, and tee-shirts. We're sorry, this yarn has been discontinued and we have very few skeins/ball left. If you just need a few, please click the Online Customer service button and let us know what you're after, and if we have it, it's yours! SILK YARN: Where it comes from, it's history, and how it becomes the beautiful fibre we know as silk. The discovery of the product silk from the silkworm species Bombyx mori occurred around 2700 BC. According to Chinese tradition the bride of Emperor Huang Ti, a 14-year-old girl called Hsi Ling Shi, discovered the invention of the first silk reel. Sericulture, the cultivation of the silkworm, spread through China making silk a highly valued commodity much sought after by other countries. In 139 BC the world's longest trade route was opened stretching from Eastern China to the Mediterranean Sea. It was named the Silk Road after its most valuable commodity. By 300 AD the secret of silk production had reached India and Japan. Silk manufacture eventually reached Europe and America. During the 18th and 19th centuries Europeans produced several major advancements in silk production. By the 18th century England led Europe in silk manufacturing because of English innovations in the textiles industry. These innovations included improved silk-weaving looms, power looms and roller printing. Between 1855 and 1865 an epidemic called Pebrine disease, caused by a small parasite, raged through the industry. It was the French scientist Louis Pasteur who discovered that this could be prevented through simple microscopic examination of adult silkmoths. Much research was carried out on silkworms at this time, ultimately setting the stage for a more scientific approach to silk production. Silk production today is a combination of old and modern techniques. Silkworm is a common name for the silk-producing larvae of any of several species of moths. The larva is not really a worm at all but a caterpillar. There are several species of silkworm that are used in commercial silk production, however Bombyx mori is the most common. Bombyx mori is native to China and was introduced into Europe and western Asia in the 6th century AD and into North America in the 18th century. It feeds entirely on the leaves of the mulberry tree, so has flourished only where conditions are suitable for large numbers of leaf-bearing mulberry trees. Bombyx mori has been cultivated over many centuries and is no longer known in the wild. Silkworms possess a pair of specially modified salivary glands called sericteries, which are used for the production of a clear, viscous, proteinaceous fluid that is forced through openings called spinnerets on the mouthpart of the larva. As the fluid comes into contact with the air it hardens. The diameter of the spinneret determines the thickness of the silk thread, which is produced as a long, continuous filament. The first stage of silk production is the hatching of the silkworm eggs, in a controlled environment such as an aluminium box, which are then examined to ensure they are free from disease. The female deposits 300 to 400 eggs at a time. In an area the size of this page around 50 moths would deposit more than 20,000 eggs, each about the size of a pinhead. The female dies almost immediately after depositing the eggs and the male lives only a short time after. The adult possesses rudimentary mouthparts and does not eat during the short period of its mature existence. These disease-tested eggs are raised in temperature and disease-controlled conditions. They are fastened to a flat surface by a gummy substance secreted by the female. The larvae hatch in about 10 days and are about 0.6cm long. Once hatched, they are placed under a layer of gauze and fed huge amounts of chopped mulberry leaves during which time they shed their skin four times. The larvae may also feed on Osage orange or lettuce. Larvae fed on mulberry leaves produce the very finest silk. The larva will eat 50,000 times its initial weight in plant material. After it has achieved its maximum growth of 7.5cm at around 4 to 6 weeks, it stops eating, changes colour and attaches itself to a compartmented frame, twig, tree or shrub in a rearing house to spin a silk cocoon over a 3 to 8 day period. This is period is termed pupating. Steadily over the next four days the silkworm produces a fine thread by making a figure of eight movement some 300,000 times, constructing a cocoon in which it intends to spend the chrysalis stage where it is in a state of sleep and casting off its skin. After this the pupae begin the sixteen days that would normally result in the miracle of transformation to a winged being - the moth. However, if the pupa (chrysalis) remains alive it will begin to secrete an alkali, which eats its way through the cocoon, ruining the silk threads. Therefore during the commercial production of silk, only enough adult moths are allowed to emerge to ensure continuation of the species. Most of the remainder of the silkworms are killed by heat, e.g. immersion in boiling water, steaming or drying in an oven. How much silk can be harvested? The amount of useable silk from each cocoon is small. One hectare of mulberry trees yields 11.25 tonnes of leaves, producing around 200kg of cocoons, but just 40kg of raw silk. The silk yield is many times smaller than this in countries such as Thailand, where the silk is reeled by hand rather than by machine. So it takes hundreds of tiny lives to produce just one silk scarf or tie. A limited number of pupae are allowed to complete their chrysalis stage, the resulting silk moths being the stud bank that produces eggs to breed future generations of silkworm. Much research has been carried out on silkworm breeding or sericulture worldwide over centuries and it continues today. Researchers are keen to establish a certain type of silkworm variety typically for low cost cocoons, disease resistance, high temperature resistance, polyphagy (ability to utilise more than one type of food), and choice quality silk. As with other types of animal farming industries, biotechnology is well established. The Thai silk moth is adapted to tropical conditions and is multivoltine, producing at least ten batches of eggs each year. Silk from the Thai moth is hand reeled from green cocoons. These are cocoons that still contain the live pupae. These small cocoons do not have the pupae 'stifled' or killed prior to the thread being unwound, as that would make it difficult to reel. The green cocoons are placed in hot, nearly boiling water, which loosens the end of the thread. With less than 10 days available before the moths emerge and ruin the cocoon, the Thai workers may run out of time, limiting the scale of the industry. Even experienced workers rarely produce more than 300g per day. The pupae may be eaten by local workers. Similar production techniques have been used in India, although increasingly Indian silk is woven using machines. The moth favoured in China and Japan is univoltine or bivoltine, producing one or two batches of eggs annually, which enter a diapausal state (suspended development) and can then be treated to induce hatching at a commercially convenient time. Cocoons are large and lend themselves to machine reeling, offering a long, continuous filament. The adult moths retained for reproduction purposes are too fat to fly, as the best fliers do not produce as much silk. The stifled or dead pupae are usually composted to feed the mulberry trees. Whilst the tropical silkworm favoured by Thailand is a natural, hardy creature quite capable of surviving in the wild state, the larvae farmed by the industrialised mass production techniques of China and Japan are selectively bred creatures aimed at maximum output for minimum input. Silk is a continuous filament fibre consisting of fibroin protein secreted from two salivary glands in the head of each larva and a gum called sericin which cements the two filaments together. Silk must be reeled off the cocoon quickly before the pupa begins to rot and taint the thread with unpleasant smells. The cocoon is then softened in hot water to remove the sericin, which frees the silk filament ends for reeling or filature. 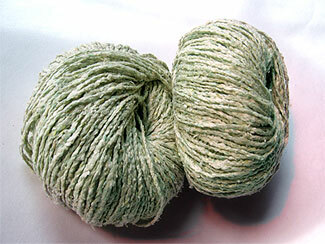 Single filaments are drawn from cocoons in water bowls and combined to form yarn. This yarn is drawn under tension through several guides and eventually wound onto reels. The yarn is dried, packed according to quality and is now raw silk ready for marketing. The worn and withered body of what was intended to become the wondrous flying creature slips silently away. It's not pretty, but it does make a beautiful fibre. Silk is a natural protein fibre containing about 70-75% of actual fibre fibroin and about 25-30% sericin. Silk filaments are very fine and long - as much as 300 to 900 metres in length. Silk has a high natural lustre and sheen of a white or cream colour; and is one of the strongest fibres at 2.6 to 4.8 grams per denier. When it is dry the elongation (elastic recovery) varies from 10-25% and when wet it will elongate as much as 33-35%. Silk has a relatively high standard moisture regain of 11%. At saturation the regain is 25-35%. Silk can be dyed before or after it has been woven into a cloth. It can be woven or knitted. Next, the raw silk is twisted into a strand sufficiently strong for weaving or knitting. This procedure is called throwing, and prevents the thread from splitting into its constituent fibres. Four different types of silk thread may be produced from this procedure: crepe, tram, thrown singles and organzine. Crepe is made by twisting individual threads of raw silk, doubling two or more of these together, and then twisting them again. Tram is made by twisting two or more threads in only one direction. Thrown singles are individual threads that are twisted in only one direction. Organzine is a thread made by giving the raw silk a preliminary twist in one direction and then twisting two of these threads together in the opposite direction. In general, organzine thread is used for the warp threads of materials, tram threads for the weft or filling, crepe thread for weaving crinkly fabrics and a single thread for sheer fabrics. Broken or waste filaments and damaged cocoons are retained, treated to remove the sericin, and combed. This is then processed into yarn, marketed as spun silk, which is inferior in character to the reeled product and much cheaper. Low grade silk is made from damaged cocoons that were spoiled by emerging moths used for breeding stock. Filaments from the coarse outer portion of the cocoon, which is removed by brushing before reeling, and the inner portion of the cocoon, which remains after reeling the raw silk, are mixed with silk from damaged cocoons to make low grade silk. In common with all other animal production systems, nothing is wasted if it can be sold. After the silk is harvested from the cocoons it is brought to the weavers for dyeing and preparation for weaving. Today most dyes are chemical although a lac (insect) dye was once used as well as plant dyes. Another product of sericulture is silkworm gut. Immediately before the cocoon stage, pupae are killed by immersion in an acid bath. Their bodies are opened and the fluid, which hardens upon contact with the air and would otherwise be used to build the cocoon, is removed from their silk glands. This 'gut' was once favoured by surgeons for stitching and by anglers for lines, but has now been almost entirely replaced by nylon, although it still figures in some surgical and contraceptive applications. World silk production has more than doubled during the last 30 years in spite of the availability of man-made fibres. China and Japan have been the main silk producers, together manufacturing more than half of the world production each year. Chinese silk is highly prized throughout the world. Since 1949 silk making methods have been modernized and silk is of better quality.